When I feel like I’m going mad I write. A lot of my worst fears have come true; fears that felt so big I could barely hold them in my head. I was convinced that when they’d happen, the world would end. But the world didn’t end. In fact, it pushed on and demanded to keep spinning through all sorts of mayhem, and I got through it. And because I persisted, I learned lessons about how to be a stronger, kinder, better human—lessons you can only learn by going through these sorts of things. This is for the people with minds that just don’t stop; for those who feel everything seemingly a thousand times more than the people around them. To start, I adore Dodie. For the most part, I have really adored all of her videos that I have seen, and a few I just didn’t like because of personal taste. Her videos are generally a joy, and it is clear that she loves what she is doing. One of my favorite things about Dodie, is her human-ness. She is so very human with her audience. She talks about her past, and her mental illness. She works to destroy the stigmas. There was even a time where she took this a bit too far, and was a bit too vunerable with her audience. However, she was very open about this issue, apologized, and has since corrected it. In my eyes, that mistake, and the way she handled it, only increased my respect for her as an artist and creator. This book was different. In general, I am a bit hesitant towards YouTuber memoirs. But, I did like this. It was different. BUT, you should be warned (I usually save this for the end of the review, but in this case, it was very prominent) there is “adult” and serious content. Dodie is, as I said, very vulnerable. She speaks in depth about her mental illness, eating disorder, bullying, abusive relationships, and some of their physical aspects. I would not suggest this book for children, although I do know that much of her audience is younger. However, if a “tween” reader you know is interested, be prepared to discuss such topics! It would open doors for vulnerable, and important, discussions. Just know, it is heavy, and some kids (I am imagining myself haha) may be at a place where they just honestly can’t grasp the real side of these issues yet. So, maybe think of it as PG-13. I think it was all written very classily, however there were some sections I personally skipped over because of the content, and my comfort level with it. The book is written in a way that it wasn’t difficult to filter, and you could still enjoy it! 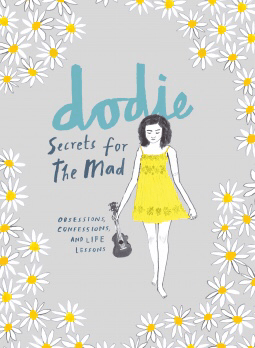 Dodie wrote this memoir in a very heartfelt, genuine way. It gave insight into her as an artist, but it also allowed those who have the same sort of experiences to connect. There were several passages that, as I read, it seemed almost as if it could have been me writing it. And, I think that is the beauty of this book. I think every person who reads it will find moments with which they can connect. Secrets for the Mad was a portrait of a young woman, living and growing. It was genuine, and heartfelt. It was so very real, which isn’t something you see too much. As I read, I felt like I was living her life through my own. For, through her descriptions, I could see her growing and learning, and I could see how I had done the same. She was giving the readers a very accessible way to connect, that I thought was really incredible. Being written in an essay format, this book was different from the YA bookshelves. It was innovative, almost a scrapbook. It really felt like you were given a journal, no actually something more intimate, like you were just given full access to Dodie’s thoughts. She included diary pages, lyrics, sketches, photos. She did a beautiful job making it immersive. Overall, I did really adore it and I am SO proud of Dodie for this piece of her journey. I can’t imagine the bravery it took to put something like this out into the world for others to read, discuss, and judge. However, I think Dodie did a wonderful job, and I think books like this are very important, as they are very real, and can help teens to understand all the crazy is very normal. I give Secrets of the Mad 4 out of 5.